Born in Argentina, Sebastian Comerso discovered his passion for cooking at a young age. He started his culinary training at two of the most lauded restaurants in Spain – Mugaritz and El Celler de Can Roca. To expand his culinary horizons, Comerso spent seven years in New Zealand working in prestigious establishments such as Cable Bay Vineyard, Te Waonui Forest Retreat and Lombardi restaurant at the St Moritz Hotel. 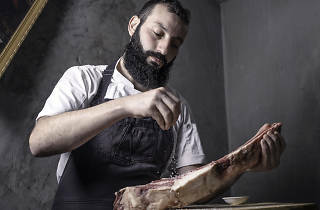 Comerso became the group executive sous chef of Maximal Concepts in 2016 and overlooks the food operations at Blue · Butcher & Meat Specialist, Mercedes Me, Brickhouse, Stockton and Limewood. Comerso will be turning up the heat on his home turf at Blue as he goes up against Maison Es chef-owner Esther Sham during Time Out Hong Kong's Chef Showdown on April 18.